On May 23, 2017 the Smart Mart, located in the 2300 block of Oates Drive, was robbed at gunpoint. The suspect pointed a handgun at the cashier and demanded money from the register. The cashier was unharmed during the offense. 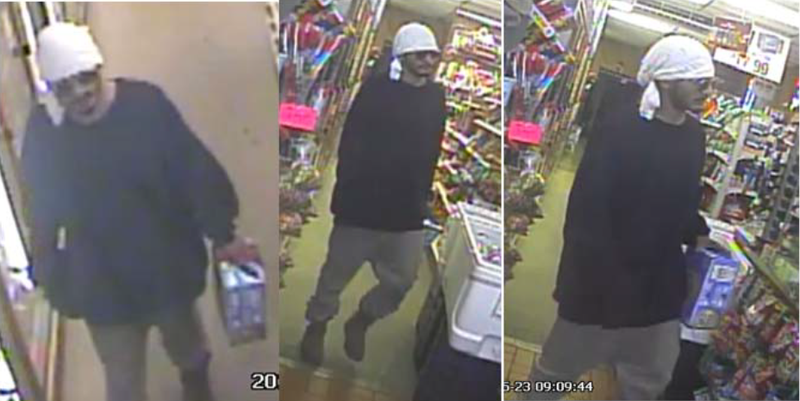 The suspect is described as a Latin male, 5’8”-5’10”, 160-175 lbs., wearing a white rag on his head, dark colored sweatshirt, khaki pants, brown work boots, and sunglasses. Anyone who recognizes this suspect or has information concerning this offense is asked to contact Detective M. Berry at (214)671-3995. If you wish to remain anonymous, you may contact Crime Stoppers at (214) 373-TIPS (8477), 24 hours a day, 7 days a week. Crime Stoppers will pay up to $5,000 for information called into Crime Stoppers that leads to the arrest and indictment for this offense and other felony offenses.